Bad news for PS3 owners, EX Kyo release delayed to 1/10 for PSN. XBL release still the same. However EX Kyo will be discounted on release for the PSN. i guess that's not too bad i'll be able to save that extra money at least. what about eu release? 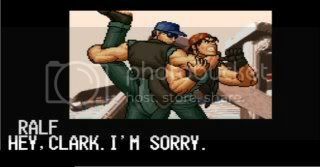 also eu should get a discount for ior since they fucked us over with that one here in the EU (eu got fucked with iori, us with kyo, seems jpn or asian version would have been best). these lucky 360 fuckers. Uh, they just mention North America, so I guess EU's in the clear. We'll find out in the next 24 hours I guess. And who knows, they might give you one, though it's only 2 dollars. Very Easy HD Bypass: , f+;b Kotosuki You (hcb+K) with B+D. Great way to start those flashy rekka chains, or just get in for the (EX)DM -> Neomax for 700+Damage. After a blowback hit of a counter hit CD, Kotosuki You B version with do the elbow, but the grab will miss. Kotosuki D Version will generally hit both. By the way, his neomax travels full screen. It's not extremly fast, and you can jump over it from that distance if you see it coming, but it's not extremly slow either. You could probably punish a few C Dragonpunches with it pretty easily, though it's no Mai or Vice Neomax. You can land a Naked Neomak off his 75 Shiki: Kai. You even have enough time to naked activate HD mode and then do the Neomax. Works best is you activate the NM when they're almost level with your head / shoulders, otherwise, you'll move UNDER them. EX Dokugami chain is pretty nice. Because of all it's hits, it seems to be a better combo ender at times, than his DMs. Something to keep in mind. Be can chain crouch , stand , stand , crouch together, before doing a Aragami punch / Mu Shiki. Mu Shiki is pretty lenient. As long as they're not flying backwards, if they get hit by the column, they pretty much bet punched. I juggled the opponent with 75 Shiki Kai in the corner, started Mu Shiki as they were at the height of the juggle, and still got the flame hit + all punches. His EX DP will throw people OUT of the corner, if you with them with it while they're juggled too high. If you want to use it to finish a juggle, wait till they're closer to you, so it traps them, and nets you more hits/damage. Just a few tips from a Non-Kyo Player Hope you can find some of it useful! how late does eu store update, im gonna buy a 20 eu psn card but no conten as i just looked. No Tears?! SNKP!!!!!!!!!!!!! YOUR LIVES ARE FORFEIT!!!!!! i know nil, i know. just got pissed of waking up happily so i can buy ex kyo and these fuckers did it again. last time i buy anything rsg related or snkp related thats for the eu. Here in my country there are Asian Versions of the game problem is? They only sell US PSN Cards!!! So much for EX Kyo. Get rid of the game to make a statement then. EDIT: I thought my eyes were playing tricks on me in those match videos of EX Kyo...but I guess they weren't. His DP does have it's Autoguard back...nice. I'll finish them in a later post. Does he have a ex version of his Mu Shiki? No sir, he does not.